A few weeks ago I was asked to talk about California tomatoes. They sent me a HUGE box of tomatoes to use in any recipe I wanted, as long as I could tell you all how great they are. And since my family LOVES tomatoes, I jumped at the chance. These tomatoes are all field-grown in an ideal climate–warm days, cool nights–which helps produce a full, meaty flavour. And they’re available fresh in Canada from May to November. One medium tomato has 35% of the daily value of Vitamin C, and no sodium, so it’s got a powerful health punch. (Learn more about California Tomato Farmers’ tomatoes here, or check out their Facebook Page). But first, a little bit of background. I haven’t always adored tomatoes. In fact, for most of my life I hated them. As a kid I wouldn’t even eat spaghetti sauce. I had my noodles with just butter. And the thought of having a big tomato slice on a sandwich or a hamburger made me nauseated. But as a mom, I’ve tried to feed my family healthy food on the whole. But with tomatoes, I just couldn’t handle the idea of “chunks”. So when the kids were little, I would chop tomatoes up using a Pampered Chef food chopper really, really tiny, and add a tomato to every tin of spaghetti sauce that I cooked. That way we were getting some fresh vegetables (I know tomatoes are really fruits, but come on), and it made the spaghetti sauce go farther. And if the tomato was chopped really small, no one could tell it was there. I did the same thing with carrots, mushrooms, and celery, by the way. Just chop them really small and add them to the beef in shepherd’s pie, spaghetti, lasagna, or just about anything. Almost every time I use ground beef I also chop up a tomato, several carrots, and several mushrooms to bulk it up and make the meat go farther. 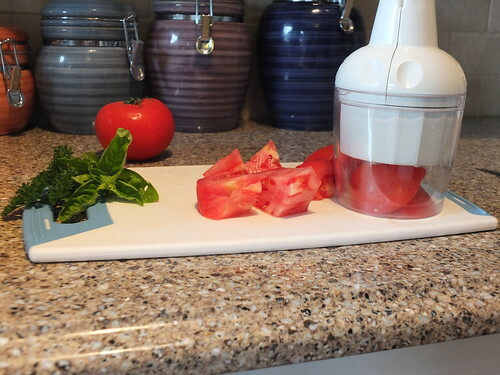 I even used to put tomatoes in a blender to add to things. It takes no time at all, and it makes what you’re cooking so much healthier. So if I’m making beef soup, for instance, and it calls for a tin of tomatoes, I just throw a fresh tomato in the blender, whirl it around, and I’m good to go. Making an alfredo sauce? Just add a blended up tomato to it for a rose sauce that tastes yummy. And there’s not the sodium you get from canned tomatoes. The real breakthrough with tomatoes for me, though, came about 3 years ago when I went to a party for Victorian Epicure, a home-based company selling herb and spice mixes. They carry this salsa spice mix that you simply add to cut-up tomatoes. 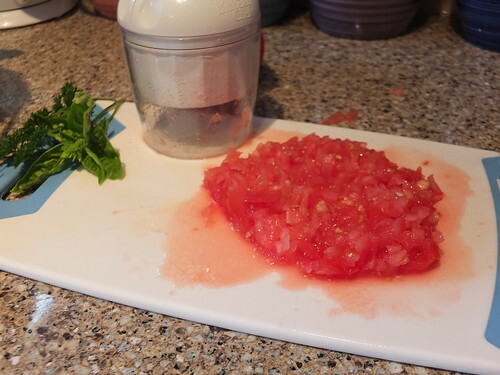 You chop the tomatoes in tiny pieces, add 2 heaping tsp of the salsa mix, and a splash of lemon juice. It takes no time at all. And it is SO GOOD! My daughters and I probably go through at least 1 1/2 tomatoes of this stuff a day. The only problem is that it’s spoiled me. I can’t eat canned salsa anymore. Seriously–we prefer salsa and tortilla chips to any other junk food. And I figure, if you’re going to eat chips, you may as well eat a fresh tomato with it! But once I started eating salsa like that, I realized that perhaps I do like tomatoes–even if they’re in chunks. And weirdest of all, my oldest daughter, who is the pickiest eater in our family, has realized she likes them, too. Here’s one of her favourite meals. Tortilla Chicken Pizza: One California tomato, chopped finely with the food chopper; one chicken breast; grilled sprig of basil; one tortilla shell; and shredded mozzarella cheese. Broil it in the oven for a few minutes, and it’s all done. That’s it. It’s super healthy, and she really enjoys it. I’d add garlic to it myself, but like I said–she’s picky. She’ll even be the one to cook it! Melt butter in a non-stick skillet and add garlic. Simmer until it smells amazing, and then add everything but the shrimp and pasta. Boil it down a little bit, and then add the shrimp. Cook only until shrimp are done. In a medium saucepan, prepare angel hair pasta. Then just mix the two together! Katie and I often have this for lunch on weekdays, because it really doesn’t take very long. What I’ve found now is that tomatoes are one of the foods that I just always have around. They’re a staple. They’re our go-to snack food with salsa, and they’re my go-to food for adding liquid and bulking up sauces. One of the coolest things about blogging is that I get to review and use great products, and I have big plans for the 50 tomatoes currently sitting in our little bar fridge in the basement. So cool! So thank you to the California Tomato Farmers, most of whom are multi-generational farming families, for sending me tomatoes. I’m going to make more salsa now. What are your favourite easy recipes using tomatoes? How do you get them into your kids’ diet? Let me know in the comments! 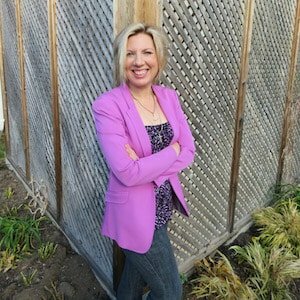 Be sure to visit the California Tomato Farmers Page on BlogHer.com where you can read other bloggers’ reviews and find more chances to win! « Reader Question: What’s Up with All Your Commenters? I personally looooved grape tomatoes in my salad! My mom has always had a fantastic vegetable garden and I’ve been spoiled but super sweet homegrown tomatoes my whole life! We have tons of tomatoes and these recipes look yummy and most definitely something the kiddos will eat! My favorite way to eat tomatoes is…ANY way! 🙂 I have always loved tomatoes. As a kid, if my family went to a restaurant with a salad bar that is what I would get for my meal because they usually have grape or cherry tomatoes and I could have as many as I wanted all to myself. I think my absolute favorite tomato dish is Caprese Salad – fresh slices of tomatoes with sliced fresh mozzarella cheese, fresh basil, a dash of salt and pepper, all drizzled with olive oil and a balsamic reduction. Oh YUMMY. This has definitely given me some things to look at changing! My husband loooooves tomatoes and I struggle with them…big time! But this summer we started our first garden with our 3 toddlers and I’ve been looking for ways to turn our garden produce into something they would love, and my 4 yo loves him some chips and salsa! Thanks for the recipes! Fresh salsa all the way! We love bruschetta. I use locally grown tomatoes and fresh basil from my garden. The tomatoes from the grocery store are flavorless compared to the locally grown ones. I don’t have to try… We all love tomatoes! My kids really love it when I make our own pizza or pasta sauce and salsa. At our old house we had a big garden and grew loads of tomatoes. This year is totally different as we moved and don’t have space for a garden. I will miss all those fresh tomatoes! I make fresh salsa too. But my favorite fall dish is roasted tomato soup..it is such a comfort food, with grilled cheese! Yum. We don’t have to bribe the kids to eat tomatoes. We LOVE them. Unfortunately, we are also rather tomato snobs, with a very strong preference to homegrown, rather than the insipid ones from the grocery store (especially November-April). We use them in Pasta Ala Caprese, salads, bruschetta, pico de gallo, BLT sandwiches, sliced on sandwiches, fresh salsa, and so much more. I used to grow cherry tomatoes right beside our pool and a favorite summer snack was to climb out of the pool, pick fresh cherry tomatoes, eat them, and jump back in the water. We sold the house with the pool, but still raise tomatoes. In Texas, our tomatoes are done for the summer, but I have 7 new plants growing for the fall crop! Great timing on this article! With 8 children and 30 tomato plants in the garden I read this with interest! Thanks Sheila! My husband is pickier than most kids I know, but he sure does love tomatoes diced up in guacamole! Sliced in a sandwich or on a burger. my kids resist cooked tomatoes, but love them raw. which is less work for me, so no complaints from this mom! Hands-down favorite: bruschetta! Slice a hearty bread into slices, brush both sides with olive oil & broil about 3 min, flipping bread over midway. In a bowl, mix chopped tomatoes, chopped fresh basil, chopped fresh mozzarella (the watery kind), diced onion, add a splash of olive oil and balsamic vinegar, and mix up. Salt & pepper to taste. Top the crisp bread slices with bruschetta mixture & top with shredded Parmesan. Broil till heated through/Parmesan melts. Best served immediately. We love bruschetta. Tomatoes, basil, a little salt, and olive oil. Serve on thick pieces of grilled bread with mozzarella. A really old fashioned way to eat them is sliced, with a sprinkle of sugar and a splash of cream! I am totally with you on “sneaking” veggies in. My husband is not a veggie fan, but when they are cooked onto a dish, he will usually way them. By the way, I really want that Pampered Chef chopper now! My kids don’t eat tomatoes. I can get my 16 year old to eat them but only if they are completely pureed into spaghetti or lasagna. If they are the least bit chunky he won’t touch it, and my 3, 4 and 6 year olds won’t touch them at all. Well, my 3 year old will eat them on pizza sometimes when he feels like it. I personally love tomatoes, but prefer them raw, so I prefer them on sandwiches or in pasta salad, and I also love them in omelettes. There is nothing better than a fresh ripe raw tomato..we eat them like apples in our home. I like to make tomato watermelon sorbet, it sounds odd, but it’s a refreshing treat in the summer. I love to make a salad of ripe tomatoes and peanut dressing with extra chopped (unsalted) peanuts added. My kid loves this. My favorite way to eat tomato is to put a big slice in the middle of a grilled-cheese sandwich. We have always said we were going to plant tomatoes so we’d have fresh ones but it has never happened. Like the idea so much of added fresh ingredients into our cooking. My favorite recipe including tomatoes is Tortellini-and-Tomato Salad, delicious! Growing up my favorite way to eat tomatoes was on white bread with just Miracle Whip on it. Now I put fresh tomatoes on everyone’s sandwiches for lunch…it’s my way of sneaking a veggie into their lunch. Our family’s favorite recipe is Carmelized green beans, onions and fresh tomato salad. We mostly like cooked tomatoes in our family. So, I like to make goulash with my mom’s canned tomatoes – the whole family loves that! I like to put tomatoes in Greek salad. I love learning new ways to get kids to eat tomatoes. This is right up my alley. I make little tomato sandwiches with cream cheese and bacon bits the kids love them. I make homemade salsa with fresh tomatoes. We also grow tomatoes–they get eaten with salt and pepper as fast as they come off the vine! My children Love Tomatoes. I have one child that will only eat cereal, chicken nuggets, oranges and tomatoes. He is a funny little guy! A favorite family recipe using tomatoes is salad. I use mixed spring lettuce, cheese, onion, black olives, croutons, dressing & fresh tomatoes. It’s very refreshing, quick & healthy. i love eating tomatoes in salads or just by themselves and i don’t have kids so cant offer any advice except to make them fun to eat teach them how they grow start a garden together. We use tomatoes with sandwiches, on salads and burgers. Kids enjoy them!! I love tomatoes on BLT’s and in taco salads. 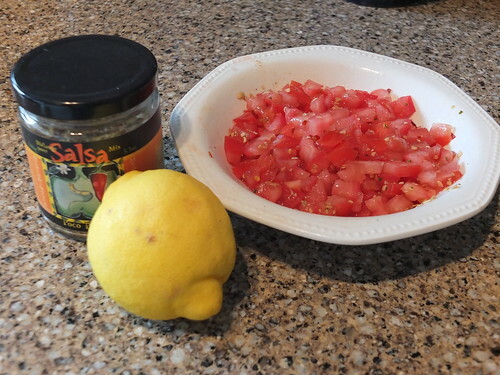 I make fresh tomato salsa,I also can it for the winter months along with spaghetti sauce! My favorite dish to make with tomatoes has to be one that goes with one of my favorite foods….bacon. A good old bacon and tomato sandwich…easy and tasty. I like to make bruschetta. We use them in Macaroni and tomatoes with onions, cucumbers, and fresh peppers from the garden. I like to make homemade salsa with tomatoes. I can get everyone in our house to eat tomatoes with lots of salsa and chips. just eat them they are so good. I love tomatoes in salsas and guacamole. I love to use tomatoes in a salad with mozzarella balls, olives, basil and a tiny bit of italian dressing. So delicious! No kiddos in our family. Our favorite recipes with tomatoes are Fiesta Rice and Mexican Chicken Soup. I have never served the soup to anyone who hasn’t loved it. I have a large veggie garden with lots of tomatoes. We can and freeze tomatoes for the winter. We make our own tomato juice which the kids love and lots of soups stews and chillis. My favorite tomato is one fresh from my garden, still warm with a bit of salt and olive oil. Yum! I’m lucky, I have the amazing vegetable eating child. WE cut em’ up and just eat em with salt sometimes. I also make an easy salad of tomato and cucumber that everyone loves.